Monarchs are experiencing steep population declines, mostly due to farming practices in the Corn Belt. Why should we care? For the futures of kids like this one! (Who just happens to be my nephew Derek, from the heart of corn country in central Iowa.) Photo by Larry Stone. “Absolutely spectacular. Nothing compares with it.” Effused Cecilia Peterson as she sat down to tell me about her three visits to the monarch butterfly overwintering sites in Mexico. At first glance, Cec (pronounced “cease”) – a retired elementary teacher and avid gardener – doesn’t have much in common with Eve Depew, a seven-year-old girl raising monarchs in Hayward, WI. But as Cec continued, describing the amazing experience of being in a forest with butterflies practically dripping from every trunk and branch, the enthusiasm and wonder that lit up her weathered face was exactly the same as Eve’s. They have yet to meet, but these girls are like two peas in a pod. In fact, Cec can more than empathize with Eve’s efforts. 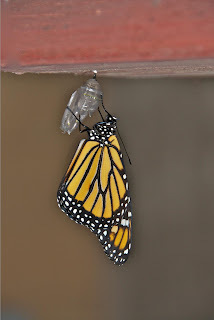 Starting in the mid-1990s, all the fifth graders in Cec’s inner-city Duluth, MN, classroom raised a monarch from egg to adult in a plastic shoebox on their desk. “That experience with nature overrode any behavior problems,” reminisced Cec. 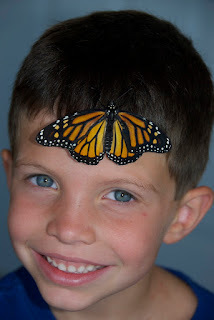 In the beginning, students like Cec’s would have only learned about the mystery of where monarchs go in the winter. While the overwintering sites have been known to locals for many years, science only discovered them in 1975. 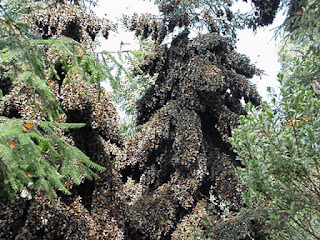 Since then, the students all over the country have learned about the amazing migration that monarch’s undergo, and the remote oyamel fir tree forests in the mountains west of Mexico City where they rest from December to April. On steep, southwest-facing slopes, ten-thousand feet above sea level, the temperatures are just right. There, in the cool, moist microclimate in the trees, monarchs bide their time. The forest is both their umbrella and their blanket. The dampness helps keep them from dehydrating, while the canopy prevents dangerous wetness. Moderate temperatures under the forest cover prevent them from freezing to death, while still being low enough to slow their metabolism, and stretch out their limited fat reserves as long as possible. On warm days, they will fly nearby for a nectar snack and drink of water. Dangers still abound in the forest, though. The canopy can’t totally eliminate freezing temperatures or ice storms, and especially when a cold snap follows rain, wet butterflies may freeze. One such storm happened the year that Cec returned to the forest for her second visit. Instead of ethereal beauty, she remembers the horrendous stench of rotting butterflies. As our climate changes and extreme weather becomes more common, scientists are worried that those dangerous storms and temperature fluctuations will happen more frequently. Compounding the weather issues are pressures on the forests to provide useful products for local residents. Although the wintering areas have been set aside as Biosphere Reserves, monitoring shows illegal logging is taking its toll. “At night, in my hotel, I could hear HUGE logging trucks rumbling down the mountain from the butterfly groves,” lamented Cec. Because of that, many of the monarch conservation efforts have been aimed at protecting these winter refuges. While the large-scale illegal logging practices have largely been brought under control since Cec last visited, the thinned forests and continued subsistence harvest of the trees allows more moisture to get through to the butterflies, and they retain less heat. Some natural predation occurs in the mountains as well, since a couple types of birds and one species of mouse have adapted to eating the sleepy butterflies. This is no mean feat, since the toxins that caterpillars acquire from milkweed plants survive metamorphosis and remain in the adults. The critters have adapted, though. One mouse can eat about thirty-seven monarchs a night in the oyamel forest. With almost all of the continent’s monarchs concentrated in one region (another smaller population overwinters in California), they become vulnerable to a single storm, drought, fire, disease, or human transgression. The concentration of monarchs also brings in a high volume of ecotourists, who mean well, and who can help support the local economy, but who can sometimes impact (literally, with their feet) the very beauty they came to revere. Despite all this, many monarchs survive the winter. The warmth of spring triggers a mating frenzy, which also triggers their reproductive diapause to end. Females can mate before they are sexually mature, and both mating and the presence of milkweed seem to speed up their development. In mid-March, these long-lived butterflies begin the last leg of their journey. Their destination is fresh, spring milkweed in the southern United States. Here, at the tail end of their 3,000-mile, 8-month journey, comes the most significant challenge they’ll face. Seven-year-old Eve knows about it. Cec gardens because of it. And there are things that you can do to help. More about that next week. 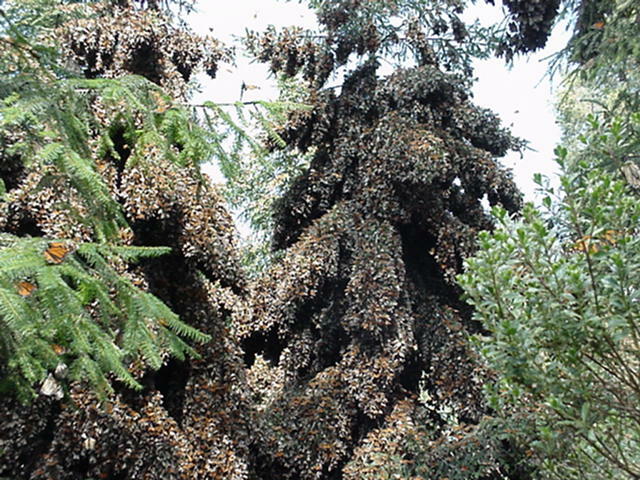 Overwintering monarch butterflies in a preserve outside of Angangueo, Mexico, completely cover some trees. Photo from Wikipedia. I see them everywhere now. Deep orange with black trim, monarch butterflies dance among the wildflowers we planted for them. Two, then three, then four! Are they fighting or loving as they bang their delicate wings? Then, calm for an instant, they alight on the many-petaled clusters of butterflyweed and sip its abundant nectar. I look closely while they are still. One, at least, is a male. I can see the slender black lines with a swollen black dot on each of his hindwings as he unfurls his slim proboscis and drinks deeply through its hollow center. This amazing tube is made of two long, C-shaped channels, which the butterfly joined together with tiny hooks and fringes after he emerged from his chrysalis. Even now, if his proboscis gets clogged with sticky nectar, he can unhook the two channels to clean them. As a female – with robust black lines – explores a nearby butterflyweed, I try to watch her feet. Butterflies taste through their “toes,” identifying their platform as a milkweed, and also determining its quality as baby food. While this low, bushy plant looks nothing like common milkweed, it is a close cousin, and one of the few host plants that can nourish monarch caterpillars. Each female lays an average of 700 pinhead-sized eggs during her two-to-six-week lifespan. Leaning in closer—hoping to catch her in the act of egg laying—I startled her into flight instead. Monarchs, with their compound eyes, have almost 360 degree vision, and use it to detect predators even with their head in a flower. The eggs that are laid now, in mid-August, will become butterflies who live longer and fly farther than their parents. The eggs laid now will become the migratory generation, and take part in an amazing, two-month-long journey. Monarchs produce three to four generations per summer, and the population grows with each new generation. By early fall, monarch numbers are at their peak. The shortening days and cooler nights of fall trigger many seasonal changes in the northwoods. Leaves begin to show their brilliant fall colors, birds stop singing and begin to migrate. Many insects enter an overwintering phase of their life cycle. Monarchs are no different. 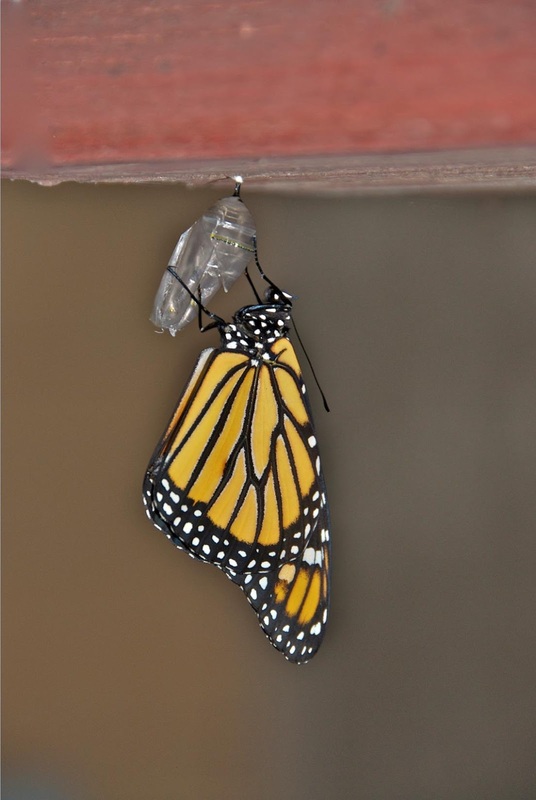 The onset of fall triggers the larvae and pupae of monarchs to enter "reproductive diapause." They metamorphose into pre-pubescent butterflies who cannot yet reproduce, but who are ready to journey south. This happens all across the monarch’s habitat at slightly different times. Canadian butterflies begin their migration earlier, swirling through Wisconsin at about the same time that our butterflies are ready to head south, too. Eve Depew, the seven-year-old scientist from Hayward, WI, who has been raising monarchs all summer, has more than a dozen chrysalids that are close to emerging. She will name and photograph each monarch, then send them out to start their journey. The building wave of peak monarch abundance hits us here in early September. The surge reaches Houston, Texas, in mid-October, and the butterflies’ destination – the Transvolcanic Mountains of central Mexico – in mid-November. These young butterflies have never seen their destination–nor did their parents, grandparents, or even great-grandparents. Flying only by day, they navigate with some combination of sunlight (the ability to see polarized light lets them know the position of the sun, even when hidden by clouds), and magnetism. Tiny “Johnston’s organs” at the base of each antenna are sensitive to stretching. They are used to detect wind and gravity, and maintain balance and orientation during flight. They may also be able to detect the Earth’s magnetic field. Even with such sensitive instruments, it is a mystery how these tiny (and thus tiny-brained) butterflies even know where they are supposed to end up. Watch for the change in monarch flight patterns as fall approaches. Their erratic fluttering from flower to flower is replaced by directional flight. Heading south, they rise on thermals of warm air, and soar on wind currents just like birds. Like a hot-air balloon pilot, they fly at the altitude with the best wind direction. And they avoid flying on days with a strong headwind. Scientists using a model butterfly have discovered that the forces from tiny eddies of air created during each wing flap generate lift. By using all of those efficiencies and by feeding regularly, monarchs are actually able to gain weight on their two-month-long trip, and can travel at least 265 miles in a day! Do you have monarch eggs, caterpillars, or butterflies in your yard, too? We may be in the presence of the greatest generation. Monarchs that are born at the end of the summer don’t fully mature. Instead, they enter “reproductive diapause,” and live longer than any other generation – long enough to fly to Mexico for the winter. The thicker black lines on the butterfly mark her as a female. Photo by Larry Stone. Colors were muted in the gray dusk, but scents were made vibrant by the splash of drops sending dust molecules skyward, where the damp air stuck them to the insides of my nose. I breathed deeply, again and again, on my way down the driveway. Sweet, green raspberry leaves. The tang of the bog. Wet asphalt. Wet gravel. And then, the earthy bouquet of the woods. “The dampness there, married now to gravity, falls branch to branch, leaf to leaf, down to the ground where it will disappear—but not of course, vanish, except to our eyes,” continues Mary Oliver. So focused was I on my nose, things did seem to almost vanish to my eyes. Until, that is, a flash of bright orange switched me between senses. The oddly shaped blob of color right next to the trail didn’t look like much. But I knew instantly that it was treasure. In fact, it was a lobster, right here in the center of the continent. Not a crustacean, mind you, but a mushroom. Lobster mushrooms, like many good things, are actually the result of a relationship between two living things. The orange-colored fungus, Hypomyces lactifluorum, parasitizes the mushroom of another fungus, and in doing so creates a tasty treat. Neither of the common host mushrooms is edible on its own. While not poisonous, Lactarius piperatus is reported to have an intensely peppery flavor. Russula brevipes, the other common host, is also harmless, but has a crumbly, Styrofoam texture that would be unpleasant to eat. Hypomyces not only renders a pleasantly firm, dense texture, it also neutralizes the peppery flavor and imparts an interesting seafood flavor. Lobster mushrooms are a delight for beginning mycophiles, since they and their hosts are easy to identify. They are on the short list of mushrooms that I’ll eat without expert help. The outer surface is bright orange and looks slightly pimply – those dots are the reproductive structures for the parasite. Breaking open the gnarled mass of what used to be a mushroom cap, I found an appealing white center. Continuing down the trail, I started to notice plain white mushrooms all over the woods. “Puhpowee was here,” I thought to myself. An Anishanabe word, it means “the force which causes mushrooms to push up from the earth overnight.” These must be the un-parasitized cousins of my lobster. But which host were they? The first crumbling snap of the stem made me think of a Styrofoam Russula, but then I noticed milky sap oozing from a broken gill under the cap. This Lactarius was lactating. “So how peppery is the milk?” I wondered. After debating the risk of eating a raw wild mushroom (something that is not advised), curiosity won out and I touched the tip of my tongue to the milk. It was spicy, but not any worse than a peppercorn stuck in your teeth, or an extra dose of wasabi on your sushi. Eating a full bite would have been certainly been painful. With tongue burning, nose humming, eyes flashing, cool raindrops tickling my bare knees, and the patter of rain filling my ears, I hurried back down the trail toward my kitchen. 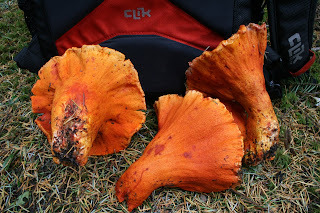 Although I’ve known about the edibility of lobster mushrooms for several years, I’ve had yet to taste one. Soon my favorite cast iron skillet was sizzling with butter, and a pile of fresh garlic was mounded on the cutting board. Into the pan went the bowl of cut and cleaned lobsters. Into my nose rose a savory perfume. Into my mouth went the first hot morsel with its bright orange rind. Without garlic, it was bland, but pleasant. It was a nice experiment, but not dinner. In went the pile off the cutting board. The flavors of garlic and butter warmed my cool evening as the rain drummed harder on the leaves. Lobsters in the Northwoods. After rain, after many days without rain, you never know what you might find in the woods. Bright orange lobster fungi sometimes hold the shape of their host mushroom, but the orange rind on the outside is actually a parasitic fungi that renders inedible hosts tasty. Photo by Britt Bunyard. In the background sits an un-parasitized Lactarius piperatus. In the foreground you can see the pimply orange rind of parasitic Hypomyces lactifluorum that renders the brittle white flesh of the Lactarius edible. Together, they become the lobster mushroom. Photo by Emily Stone. “What’s that! ?” exclaimed Ellie. “Where?” “What?” “I see it!” “Weird!” came the jumble of replies. Six strong girls were relaxing on the riverbank, philosophizing about how they came to care about nature. This group of high school girls from the Northland College summer program had just paddled a short but beautiful stretch of the Namekagon River, taking time to catch aquatic insects, learn about river geology, and check out some amazing flowers in bloom. Now, something crazy was interrupting our conversation. A wisp of a creature floated in and out of view. For not appearing to be a strong flyer, it certainly sped along faster than the eye could focus on its form. It was just the size of the hole in your fingers when you make the “ok” sign, and barely more substantial than that empty space, too. The mystery came and went all afternoon, interrupting our discussions as we all tried to get a better look at it. Black and white bands on the thread-like legs broke up its outline, and allowed it to disappear against the backdrop of vegetation. We tried to catch it, but all depth perception failed. Finally, I too, had to fade into the river and return home. Back in my kitchen, movement at the window caught the corner of my eye. There it was again! This time, with the internet close by, I was able to solve the mystery. 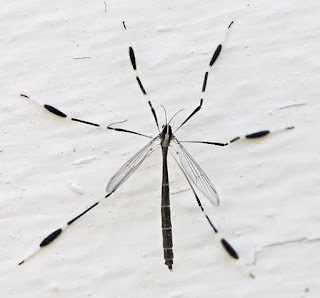 Aptly named, these creatures are phantom crane flies. Last summer I wrote about the much more substantial giant eastern crane fly. Phantom crane flies are in a related family all their own, and are known for their ghostly ability to disappear. Their preference for the dense and shady vegetation along wetlands aids in their habit of vanishing into the background. When you finally do see a phantom crane fly, they are no less astonishing. All legs are held perpendicular to the ground when they fly—spread out in a big circle—making them look a little like a floating snowflake. They barely use their wings when flying. Instead, their legs are light and hollow, and have inflated sections at their tips that catch the breeze like little sails. This low-energy movement is useful for an insect that isn’t known to eat as an adult. Mating is likely their main goal, and it occurs either in mid-air, or with the female clinging daintily to a leaf. In either case, the smaller male is suspended from the female’s abdomen, and doesn’t seem to fly or perch at all during the process. The female then dips the tip of her abdomen in water or mud and deposits over 300 eggs at a time. Small worm-like larvae hatch, burrow into the muck, and then breathe air from the surface through a long siphon tube. They eat debris and organic matter before metamorphosing through the pupa stage and becoming the only slight less cryptic adult. In the process of sharing the answer to our phantom encounter with the girls, I reflected back on our insect-interrupted conversation about why we care. Time in nature and encounters with wild things were two common themes. And, whether the girls realize it or not, I believe that it is also their willingness to be curious, and to be excited by the mysteries of the world that will keep their love of nature alive. 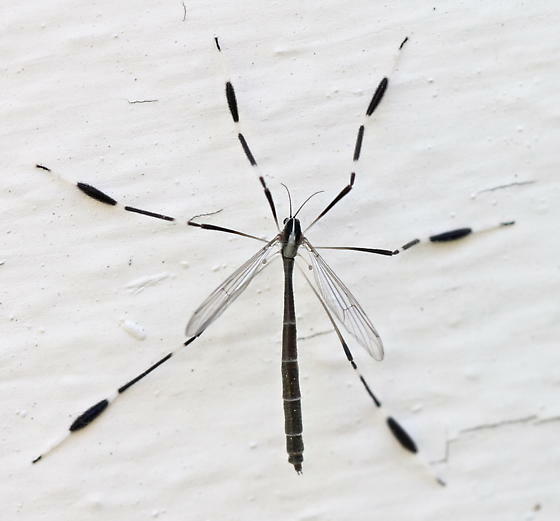 Phantom crane flies are fairy-like creatures with tiny wings and tiny sails on the tips of their black-and-white legs. Look for them in dense wetland vegetation.